The envmapped version of the cube actually looked rather nice, shame about the sun sprites later on. Still, glad to see activity on the Dreamcast! 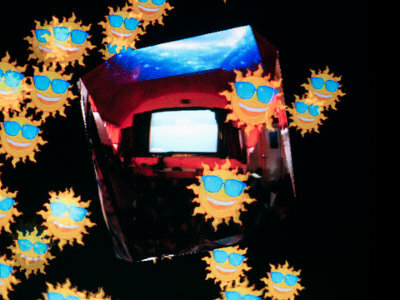 Hated the sun sprites, but the cube was wow! Please, provide the CD image... Can't run this from Windows / Demul. It might not look like it in real life, but the ceiling of the sundown partyhall is actually a galaxy. Looks much better than in the screenshot. Lovely effec but no thumbs up, because the presentation is totally meh and lazy. Simple, but the envmapping looked cool. Kind of reminded me of the Dural part in Sega's Model 3 tech demo. I liked the colors, am i gay? baah: yes. Starting thinking about how to break the news to your family. Demo: cool. I like the meshing effect, it looked pretty with the env map, and I like the way this was presented, setting expectations low and then beating them :) Always a good way to please the audience. Much better than on screenshot. Tested on lxDream, checking it on real thing when at home. Thanks Rebb for the CDI image! :) Runs ok in Demul! page created in 0.015423 seconds with 15 queries.